The meeting was held at Michèle home. In attendance were Colette, Janet, Joan, Jolene, Linda and Shirley along with Michèle. 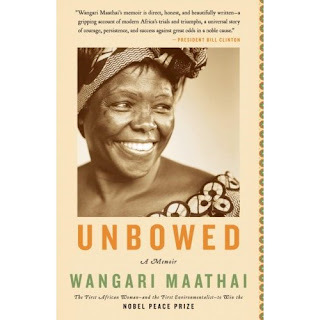 The book this month was Unbowed, the autobiography of Wangari Maathai presented by Linda. She is the first African woman and environmentalist to win the Nobel Peace Prize that was awarded to her in 2004. The book was enjoyed by all members present at the meeting. It has been many months since all liked the suggested book! All felt that Ms. Maathai's life has been inspirational. Many members noted her positive attitude and determination not to back down when she believed in her goal. She founded in 1977, the Green Belt Movement. In the first 10 years, the GBM planted over 20 million trees in Kenya alone. She has worked with mothers and strongly believed that every tree planted is significant and that each alone may be insignificant but the cumulative effect has a significant impact. She has given many women a goal and has empowered them to change their community. Ms. Maathai's description of her childhood and of Kenya give's the reader the opportunity to learn about what Africa was like, what it is today, what is needed to become a developed continent. We also talked about what she had to sacrifice for the greater good, her family life and her health. She acknowledges throughout the book that the opportunity to study in the United States via the "Kennedy Airlift" gave her the confidence and knowledge she needed to stand up for what she believed further in her life. Those who wish to read more about the Green Belt Movement can check the website. It has along with information about the Movement, ongoing articles about the present situation in Kenya. As usual Jolene found the reference to the title of the book. In the Anchor Books 2006-07 soft-cover edition, it is on page 222. halfway through chapter 10. The actual quote is "The story of Freedom Corner did not end with my hospitalization or the dispersal of the mothers. We remained unbowed. The day after the police attach, many of the women, on their own, returned to Freedom Corner". The Webster dictionary defines the word "Unbowed" as 1. not bowed down; 2. not subdued. it is, in my opinion (Michèle) the perfect title for the autobiography of this woman! The next meeting is March 31st, one week later than the normal 4th Monday of the month because of Easter. It will be at Beth's home. The book is Jolene's choice Life of Pi by Yann Martel. April's meeting will be at Linda's home with Beth's choice of book, The City of Falling Angels by John Berendt. Those of you who enjoyed his first book Midnight in the Garden of Good and Evil will surely enjoy this book about Venice! May's meeting will be at Shirley's home with Colette's choice, Suite Française by Irène Nemirovsky.